Amidst a frenzy of alternative-fuel vehicles and tax credits to those who avoid gas powered models, BMW has made an announcement that has been many years in the making. They are finally going to send diesel models to the US. Like Mercedes Benz, BMW has been building popular diesel powered models overseas, but with MB bringing some of their oil-burners to the US, BMW has answered with at least two models of their own. The 2009 BMW 335d and X5 35d are expected to become available for sale in November of 2008, and both of these vehicles will be packing a twin turbocharged, 3.0L engine making 265 horsepower and a whopping 425lb-ft of torque. That is plenty of power to get you from point A to point B and that torque will certainly bolster performance, but the best news is that BMW expects these models to get in the area of 23mpg around town and 33mpg on the highway. There has been no mention of either of these models in the US Governments tax credit vehicle list, but with their fierce opponent Mercedes Benz gaining that advantage its only a matter of time before BMW offers a similar incentive to these models, which are among their most popular in gasoline powered form. Short article with info about the new Diesels, im excited! Better but still not great, BMW will come out with a great FE car eventually. Too many great engineers at BMW to not some up with something great. I sold mine to get my TCH, I told the BMW dealer that I would not buy because of their horrible FE. Their response was call me when you get bored of driving the Toyota. Better but still not great, BMW will come out with a great FE car eventually. 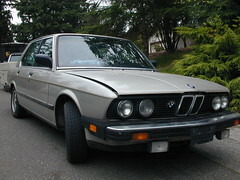 The real question is does anyone remember the last diesel BMW to be sold in the US? Nice link... I can't remember it though. I can't remember it though. How can anyone forget the mid 80s 524td. It could literally smoke any car . It's 2.4 single turbo engine produced 115 HP and 155 ft-lb of torque and would return 21 city and 26 highway using the New EPA estimate. The two diesels mentioned in this thread are producing 50% (2.0L) to 100+% (3.5L) more power/torque with significant gains in FE and if they're coming to the US, significantly better emissions. I can't wait for the 335d! I am going to goto a different dealership each weekend and test drive it multiple times. The thing is a torquebeast. oops! thanks for that man! now I remember! dang! what a nice car! If a German manufacturer dared to import a regular diesel designed for optimum fuel economy rather than a doped-up EPO/steroid torquemaster speed special, then I would possibly be interested. Americans are beginning to embrace these new diesels. A 2008 survey by JD Power states that by 2015, 10% of cars sold in the US will be diesels compared to the current 3% of sales. One of the biggest advantages with these vehicles is their fuel efficiency. Overall the diesel versions get on average almost 10 mpg, or 30%, better mileage than their gas model siblings. Right now probably because diesel is the same price as gas or even cheaper. It changes in the winter. But still I think they will distinguish between diesels like the VW Jetta TDI which has no additional maintenance issues vs. the BMW 335d which needs to have that ammonia tank refilled. I think eventually they might also distinguish that the increased torque on diesels makes them powerhouses in urban areas. They really shine when it comes to oomph in stop & go driving.